This paper aims to discuss the impact on promoting student satisfaction and improving their involvement in their own learning when applying a “Flipped classroom” design in a first-year bilingual, English-taught module in a non-English-speaking country. “World Economy” is taught in the Faculty of Business and Economics at a traditional, face-to-face (F2F) Spanish publicly-funded institution, the University of Oviedo (Spain). It is a bilingual module, where English is the medium of instruction and evaluation to a cohort of Spanish-speaking freshers. During 2013–14, the instructional designers implemented a “Flipped Classroom” design for this module: content delivery through videos in English of the different module topics, pre-class questionnaires answered through the University Virtual Learning Environment, instructor mediation between students and content through mini-lectures and Just-in-Time Teaching, student-centred active learning approach for in-class sessions, and individual practice combined with peer-instruction mediated by the instructor. Therefore, the design targets module contents, skills practice and improvement of students’ linguistic skills. This paper aims to discuss the extent to which applying a “Flipped classroom” design in a first-year bilingual module at Business and Economics Faculty in Oviedo University (Spain) promotes students’ satisfaction and improves their implication in their own learning. The most widely accepted solution to the conundrum of teaching Economics through a foreign language while aiming at keeping content-wise excellence has proven to be the use of Content and Language Integrated Learning (CLIL). It is an umbrella term which encompasses different forms of using language as medium of instruction by “integrating language and subject teaching, various forms of educational success can be achieved where classrooms comprise learners with diverse levels of linguistic competence” (Marsh 2006, p. 3) and, as such, it is “essentially methodological” (Marsh 2008, p. 244). Without making much differentiation between language and content, CLIL creates an “innovative fusion of non-language subject with and through a foreign language” (Coyle, Hood and Marsh 2010, p. 1). This approach focuses mainly on explaining meaning and not language per se, thus allowing “implicit and incidental learning” which occurs in “naturalistic situations” (Marsh 2002, p. 72) which fits the Economics classroom fully, as it suits the purpose of learners who prefer “to learn as you use and use as you learn” (Marsh 2002, p. 66) rather than learning language on its own or as separated from Economy and its analysis. Nevertheless, teaching in bilingual curricula, under a CLIL approach poses a challenge to instructional design as it is necessary to integrate content learning with instructional language practice. On the one hand, students are assumed to already have “an adequate command of the language, but many lecturers report the opposite; in any case, overlooking linguistic competence seems unwise as their “school English” can be very different to the academic English they are demanded at university” (Erling and Hilgendorf 2006, p. 284). On the other hand, this students’ lack of linguistic knowledge and sophistication for the specific tasks and content which are planned in heavily theoretico-practical degrees such as Economics could give rise to the feeling that, at some point, either language or content development must be compromised. Academics have been wary of the watering down and simplification of content in order to make it linguistically comprehensible (Costa and Coleman 2010). Consequently, teachers who approach teaching Economics through English from a CLIL perspective usually create, alongside content development, linguistic-based designs which help develop their students’ linguistic skills, solve meaning-rooted issues and, first and foremost, contribute to the grasping of concepts and the fostering of skills which are directly related to the discipline. An instructional technique that fits well to all these demands is “Flipped (or inverted) Classroom”. To foster content and language-based skills alike and prevent language from becoming a block to learning degree-specific competencies, it is essential that students come to class prepared (linguistic micro-skills, specific terminology, familiarity with concepts…) through a previous first contact with assigned working materials. Students watch videos outside the classroom to have this first contact with course materials and then answer on-line questionnaires related to the content and procedures in order to aid in-class performance and detect major comprehension problems. Face-to-face (F2F) time can then be devoted to active and collaborative learning, thus creating learning experiences for students where they use academic and subject-specific language. Designing a module following the principles of “Flipped Classroom” could be an appropriate way to fulfil the various demands bilingual curricula pose. Recent evidence-based research (Deslauriers et al. 2011; Bates and Galloway 2012; Bishop and Verleger 2013) supports the use of this educational design in Higher Education. New technology is drastically changing the conditions in which teaching and learning is conducted and this is also true for higher Education. Technology used outside the classroom to deliver content is an efficient way to prepare students for classroom activities and increases the class time available for student-centred active teaching. This pedagogical strategy could help traditional brick-and-mortar Universities to add value to F2F interaction in a digital world (Bowen 2012). So, nowadays abundant on line resources make blending the teaching process possible and move content coverage outside the classroom, in order to spend in-class time to promote high order thinking skills. Therefore, generally speaking, Blended Learning can be understood as on line activity blended with classroom-based delivery. This is a really broad definition that embraces different types of blended learning experiences, abundantly developed lately in all levels of education. As a result, a terminology confusion arose between the terms hybrid, blended, flipped and inverted. All these are inconsistently defined in the literature creating a barrier to efficient research on and implementations of these types of classes (Margulieux et al. 2014). To explore the concept of blended learning and define more precisely the idea of the “Flipped Classroom” among the different variations of blended, it must be assumed that a “consensus is emerging that a blended course combines online learning with traditional F2F class activities in an intentional, pedagogically valuable manner where between 20% and 79% of course content and activities are delivered online” (Arbaugh 2014, p. 2). “a pedagogical approach in which direct instruction moves from the group learning space to the individual learning space, and the resulting group space is transformed into a dynamic, interactive learning environment where the educator guides students as they apply concepts and engage creatively in the subject matter” (FLN, 2014). So, in a “Flipped Classroom”, students watch videos outside the classroom to have their first contact with course material. F2F time focuses less on content and more on application of this material to new context, development of higher-level cognitive processing and collaboration, creating significant learning experiences for students (Bowen 2012; Dee Fink 2013). Anyway, this “official” definition is also quite ambiguous; it does not help to list Flipped Learning among the different types of Blended Learning. This definition focuses mainly on how the F2F spare time is transformed into an active learning environment and pays little attention to the online elements of the mixture. Although this active learning aspect is crucial for understanding what Flipped Learning is and it constitutes the essence of the improvements in learning that this approach could offer, it is important to take into account how the online elements are integrated into the design. Therefore, it is essential to have a clear conceptual framework that serves as a taxonomy and helps to place each particular experience among the various Blended Learning designs. Margulieux et al. (2014) have designed one of these frameworks and they identify two dimensions as critical to differentiating types of courses: delivery medium and instruction type. Delivery medium refers to how instruction is delivered to students. The two main types of delivery media are via an instructor and via technology. Delivery via an instructor implies that the learner receives instruction in a F2F environment, whereas delivery via technology makes no assumptions about the physical environment of the student allowing for flexibility in the learning experience (Margulieux et al. 2014, p. 3). The dimension of instruction type is defined by the roles that the students and instructors take during instruction. The two main types of instruction are information transmission and praxis. Information transmission is an instructor-driven delivery of content to the learner where the instructor or instructional program dictates information while the student receives it. Praxis, on the other hand, is defined as student-driven learning where the student applies knowledge while the instructor or program supports the student by providing guidance and feedback (Bishop and Verleger 2013, p. 4). Delivery medium and instruction type dimensions orthogonally cross to form the four quadrants that represent the four fundamental learning experiences of Learning Experiences Taxonomy (Margulieux et al. 2014, p. 5). Following this framework, Blended Learning experiences include a substantial portion (25% to 75%) of teaching methods from both delivery media (i.e. delivery via instructor and delivery via technology) and both instruction types (i.e. information transmission and praxis). So, there are many possible types of blended courses that can be defined by this taxonomy by blending the fundamental and combination learning experiences. Consequently, following this approach, flipped classes are those in which students receive content from technology (i.e. technology-transmitted) and apply knowledge with help from an instructor (i.e. instructor mediated). Each concrete course design should provide enough information and be specific about how much of each dimension is expected to describe the degree of blending within courses. In this way, it is possible to locate the specific experience inside the taxonomy quadrant, clearly differentiating among them, and giving more sense to the habitually used terminology of “Hybrid, Blended, Flipped and Inverted” (Margulieux et al. 2014). Over the recent years, the Faculty of Economics and Business of the University of Oviedo (a traditional, F2F Spanish publicly-funded institution) has gradually introduced bilingual courses. Thus, since the academic year 2010–11, the Degrees in Business Administration, Economics and Accountancy and Finance offer the possibility to study the different modules of the curriculum in English. “World Economy”, belongs to the bilingual curricula where English is the medium of instruction and evaluation to a cohort of Spanish-speaking freshers. It is a first-year, second-semester (14 weeks from February to May), compulsory module in a BA in Business Administration. It is part of the student’s basic training, worth six ECTS credits. The general aim of “World Economy” is to provide students with the core concepts, models and institutions related to the global dimension of issues in economics and business. This module deals with topics typically related to international trade and the World Trade Organization, the international monetary system and the International Monetary Fund, exchange rates and foreign exchange markets, growth and development and population, resources and environment. In this manner, “World Economy” provides students with basic knowledge about issues within these topics and introduces students to the different fields of professional and academic specialization that they will explore in more detail in more advanced modules. During 2013–14, the instructional designers developed a “Flipped Classroom” design for this module: videos of the different topics in English to deliver content, pre-class questionnaires answered through the University VLE, instructor mediation between students and content through mini-lectures and Just-in-Time Teaching, student-centred active learning approach for in-class sessions, and individual practice combined with peer-instruction mediated by the instructor. So, this is a competency-based programme designed to target module contents, skills practice and improvement of students’ linguistic skills. Even though the admission process is selective (English-taught students require a minimum 70% grade in the English test of Spanish University Access Tests in order to enrol), the practical, Applied Economics approach to the module designs specific tasks for the student-centred, active in-class sessions which students might find challenging from the point of view of language. These elements of the design, one of the cornerstones of the “Flipped Classroom” technique, can be demanding even for fresher Spanish-speaking students whose command of the language is on native level and deal proficiently with communicative challenges. Facing such challenges in a second language gives rise to multiple added difficulties. Firstly, students need sufficient linguistic skills in order to sustain the cognitive processes necessary for their learning. Secondly, they have to use the second language as a vehicular instrument for the specific knowledge to be grasped, plus technical and academic terminology inherent to that content. Finally, they need enough command of the second language as it is also the instrument for the effective communication of this knowledge, particularly as they are assessed in this language. 63 students of World Economy participated in this study, among which twenty-six male (41%) and thirty-seven female students (59%). To measure students’ satisfaction, the researchers used an adapted two-part questionnaire from Johnson (2013) with 12 likert-scale questions to measure four aspects: “Flipped Classroom” general elements to measure students’ general perceptions of the method in terms of how engaging it is, what kind of communicating opportunities it provides, how much it fosters motivation; time aspects to measure the time students spend at home doing course-related work and how students were spending their additional classroom time; self-paced organisation questions to measure how students feel about taking quizzes at their own pace, whether they like the quizzes and found them easy or not; and technology disposition questions to measure whether students are willing to use technology in their learning. Videos are one of the foundations of the design so it is important to question students about their perception of this media and the role that videos and VLE played in the Flipped Classroom. In addition, to adapt the instrument to our context, we added one likert-scale question to assess the usefulness of in-class activities and four open questions. The usefulness of in-class activities question helped the researchers to assess whether students appreciate the active learning possibilities the design offers. This aspect of the design is of great importance as the usual instructional technique used in Spanish Universities is lecturing. So, students are not used to different ways of teaching or interacting in F2F settings. The research methodology, used to measure students’ satisfaction and contrast these hypotheses, is a quantitative and qualitative analysis of students’ answers. The analysis of results is divided in several sections related with the research questions proposed. To assess to what extent Students react positively to general elements of the “Flipped Classroom”, we focus on some of the questions the students were asked. As shown in Figure 1, most students (65%) agree that the “Flipped Classroom” is more engaging than traditional classroom instruction. Only 7% of them disagreed with this suggestion. Also, more than 60% of the students agree with the statement “I am more motivated to learn the course’s topics in the Flipped Classroom”, so we could surmise that this method encourages student motivation to learn new topics. This positive attitude towards this innovation is especially important as a negative attitude from students is one of the biggest obstacles to implement this type of instructional innovations. The “Flipped Classroom” is more engaging than traditional classroom instruction. Source: Own elaboration. Therefore, we can say that in our setting the students reacted quite positively to the efforts made to introduce some modifications in the Spanish Universities’ traditional instructional methodology based in lectures and recitation. 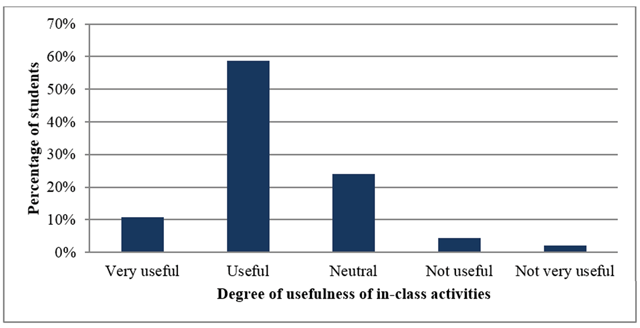 It is important to also observe, that more than half of our students believe that the “Flipped Classroom” gives them greater opportunities to communicate with other students, as can be seen on the graph of Figure 2. In a bilingual CLIL classroom like this one, where the students have to practice their linguistic skills, is especially relevant that the instructional strategy promotes communication and that students perceive this extent. The “Flipped Classroom” gives me greater opportunities to communicate with other students. Source: Own elaboration. In terms of motivation, more than 60% of the students feel more motivated for learning, a fact that is critical in order to get students to engage with the course and participate in the learning process. As a result, taking into account the results obtained in Figures 1, 2 and 3, it can be stated that students did react positively to general elements of the“Flipped Classroom”; they appeared to be more motivated and considered than their opportunities to communicate with other students were greater than in the traditional setting. I am more motivated to learn course topics in the “Flipped Classroom.” Source: Own elaboration. To measure the extent to which this learning experience improves students’ willingness to get involved in using technology for learning; several questions were asked relating to videos and virtual campus use. Most of the students (80% of them) declared to regularly watching the video assignments and 70% of the students either agreed or strongly agreed that they like watching the lessons on video, as can be seen on the graph. Nevertheless, more than half of the class presented a neutral position (54%) with regards to the statement “I would rather watch a video lesson than a traditional teacher-led lesson” which perhaps could be interpreted that students still value F2F interaction with the teacher. Therefore, the students are happy with using technology to learn and like watching videos or other multimedia resources, but they feel comfortable with and value an interactive teacher-led session. The tendency to value the role of technology in their learning is reinforced by the importance they attribute to Virtual Learning Environments (VLE). In our University, a Moodle VLE is the platform used to support on-line learning and in a “Flipped Classroom” this resource is essential. 33% of the students strongly agree that the Virtual Campus plays an important part in their learning, 35% of them agree with the statement. Only 9% disagree. So, according to the previous data from Figures 4 and 5, this learning experience improves students’ willingness to get involved in using technology for learning. I like watching the lessons on video. Source: Own elaboration. The Virtual Campus course page plays an important part in my learning. Source: Own elaboration. An important aspect of the “Flipped Classroom” is that students have to be prepared to go to classroom. Most of their first contact with the material happens through previous self-regulated work so this type of approach demands higher levels of student responsibility. In general, students do not like these types of designs as they are more demanding. This is not different in our context and when we asked students if they like self-pacing themselves through the course (Figure 6), 48% of them adopted a neutral position. 46% of the students in our sample strongly agreed or agreed with this item and only three students (7%) disagreed. I like self-pacing myself through the course. Source: Own elaboration. Curiously, as can be seen in Figure 7, most students (more than 60%) find it easy to pace themselves successfully through the course. But, again, a relatively high percentage (30%) of people chose the neutral option with regards to how easy they have found it to deal with this responsibility. I find it easy to pace myself successfully through the course. Source: Own elaboration. In short, students may not be already prepared for the self-regulated learning the “Flipped Classroom” offers as it is an important deviation from what they have been doing during the previous school years and it requires a considerable degree of responsibility. One of the key elements of a design like this is the type of interactions that are proposed during the in-class sessions. Since the teacher will not lecture as the main activity, some kind of student-centred teaching has to be implemented. This research also wanted to know how useful the different elements of the active learning applied in F2F interactions were for students. Under this active learning approach, the professor proposed several types of activities. To measure to what extent students appreciated their usefulness, they valued them between one (not very useful) and five (very useful). The main result is that they assessed all the activities on averages higher than 3.5, showing a great usefulness of active learning. Acording with Figure 8, Teachers’ wrap-up sessions, based on the on-line quizzes students have to answer after seeing the videos, were highly appreciated by students as 70% of them considered them as a useful or very useful activity. Teachers’ wrap-up sessions based on the on-line quizzes. Source: Own elaboration. Even in-class quizzes solved with Socrative (an app that allows professors to develop quizzes which are answered through the use of the students’ mobile devices thus generating a more dynamic class environment) were well valued (Figure 9), although they were not as good as the researchers had thought. Although almost half of the students considered them as useful or very useful, almost 50% of them were not really keen on the activity. Problems with wireless connection inside the classroom, different models of mobile or smart phones or students’ reluctance to use their private mobile data connections could explain this opinion. In-class quizzes solved with Socrative. Sources: Own elaboration. Wall-paper and poster activities (standing-up projects developed for the creation of a dynamic environment in which students worked in groups to discuss and design posters about some topics covered during the course) were also very well valued by three quarters of the class, as can be observed in Figure 10. Students really appreciated the opportunities that standing up and moving around the classroom gave them for communicating and comparing their work to that of other students beyond their own small working group. Wall-paper and poster activities. Source: Own elaboration. Following Figure 11, Balance of Payments exercises and working sheets was the most useful activity for the students, with an 85% of them considering it as useful or very useful. This result could be biased by the fact that students knew in advance that a question in the final exam would relate with this topic. Balance of Payments exercises and working sheets. Source: Own elaboration. Other activities such as the World Trade Organization (WTO) puzzle session, WTO case analyses with Pecha-Kucha presentations, foreign exchange market peer review exercises and country report working sheets were also very well valued. All of them ranked from 50% to 74% of students valuing them as useful or very useful (66% on average). The students answered in the final satisfaction questionnaire four open questions about which advantages and disadvantages they associated with the “Flipped Classroom”. The paper presents their answers using two tag clouds created to quickly highlight the most outstanding terms in their answers, i.e. the ones that they repeat more. Among the most repeated terms, two different categories can be distinguished in Figure 12. At a first level, the repetition of “learn”, “improve”, “flipped”, “students” and “better” is evidence that students value the quality of teaching and realise that the flipped design helps them to enrich their knowledge and to do better in the course. Advantages tag cloud. Source: Own elaboration. 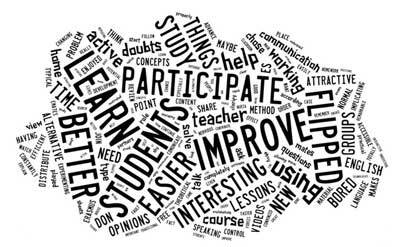 A second level of words (“easier”, “participate”, “interesting”, “new”, “active”, “groups” and “videos”) shows that students recognize several positive and engaging elements of this student-centred teaching, such as the active learning, the group activities or the video lectures, even though they are not really familiar with the design and it is new for them. In short, students value the novel aspects of the “Flipped Classroom” design; they are able to appreciate and accept it as a global educational improvement above the specific elements of the method and its implications for them individually as learners. 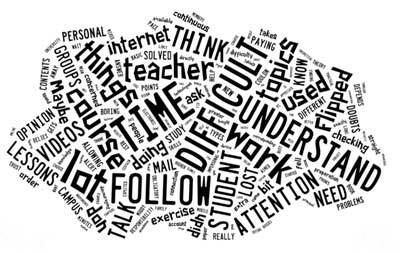 As disadvantages, in Figure 13 the terms “time”, “difficult”, “follow”, “work”, “teacher”, “think”, “lot”, “attention”, evidence that students value negatively the extra-effort that the “Flipped Classroom” involves: of course, video lectures, quiz answering and personal construction of knowledge, presuppose a greater amount of time and effort needed to understand the topics. Undoubtedly, time is the most important drawback of this design. Drawbacks tag cloud. Source: Own elaboration. Besides, the methodology demands higher self- and co-regulation of learning in order not to be left behind. This instructional approach, contrary to traditional lectures, provides students with a greater variety of resources from which they have to extract the information on their own. This increases the responsibility of students in recognizing and solving their questions about the topic. In order to discuss the impact on promoting student satisfaction and improving their involvement in their own learning when applying a “Flipped classroom” design, a research project has been conducted in a first-year bilingual, English-taught module in a non-English-speaking country. “World Economy” is taught in the Faculty of Business and Economics at a traditional, face-to-face (F2F) Spanish publicly-funded institution, the University of Oviedo (Spain). It is a bilingual module, where English is the medium of instruction and evaluation to a cohort of Spanish-speaking freshers. Bilingual education, as distinguished from immersion programmes, assumes that the role of language for the participants needs not be taken for granted, and devises interventions to foster linguistic skills alongside content. Rather than a strict method, it fosters a flexible, inclusive approach which can be applied through many specific methodologies, as far as these observe both content and language as integrated under a CLIL approach. The introduction of English as the medium of instruction entails an important challenge for institutions, practitioners and students. While it opens an opportunity to revise tactics for instruction, most of the participants have been more wary of the problems it brings to already existent programmes of study. First of all, institutions and their lecturers have found themselves at odds with achieving satisfactory educational outcomes when teaching in English, in comparison to the seemingly successful degrees which were or are still taught in the students’ native language. The foreign language has been perceived not only as a threat to equal opportunities – since the diversity and inequality of language learning opportunities is apparent, and often closely linked to economy – but also as a barrier to learning. A foreign language has often been perceived as disengaged from the main concerns of these degrees, which are learning needs, knowledge and the methodologies to foster those. This divide between language and content has proved lethal, particularly in financially struggling countries such as Spain. The reputation of programmes of study which aim at conveying content through a second, non-native language has been compromised by the failure to make the necessary adjustments in budgeting, staff development and educational design. While academics have been aware of these problems, increasing and more global competition amongst universities has furthered the amount of full or partial bilingual degrees in European institutions and, to the eyes of many, has supported the idea that teaching through a foreign language necessarily results in poorer learning. In this context, the paper presents a research that focuses mainly in the necessary instructional techniques renovation that using English as a Medium of Instruction (EMI) under a CLIL approach demands. So, the main element to discuss is how design can be used for learning improvement in an EMI context. To measure how well the design supports students in the bilingual module analysed, the course has been redesigned into a Flipped Classroom where students are firstly exposed to material through videos and online materials distributed through the University VLE. Consequently, the spare F2F time is devoted to a more interactive teaching method sharply differentiated from the traditional instructional techniques applied usually in Spanish Universities based on lectures and recitation. To measure students’ satisfaction with the reformulation of the module, the researchers used an adapted two-part questionnaire from Johnson (2013) with 12 likert-scale questions to measure four aspects: “Flipped Classroom” general elements, time aspects, self-paced organisation and technology disposition questions. In addition, to adapt the instrument to our context, we added one likert-scale question to assess the usefulness of in-class activities and four open questions. The general conclusion is that the students show a positive attitude towards this blended design, especially with respect to the motivational power of technology usage and the practical implications of the active learning aspect. In addition, they also valued very positively the majority of the activities performed in class, such as the Balance of Payments exercises and working sheets or the teachers’ wrap-up sessions based in the Follow-up results. Regarding the answers that the students gave to the four open questions in the final questionnaire, they are aware of the extra-effort the “Flipped Classroom” entails, however, there is a general feeling of improvement among the students, as they believe they have enhanced their learning by means of participation, critical thinking and active learning. Future research on the “Flipped Classroom” has to be done to assess the effects of this type of design on students’ motivation and engagement. It will be especially interesting to study its effects on students’ learning outcomes compared to other types of instructional designs. One crucial element for any future improvement of the design is to clearly describe all the activities used both in-class and outside the class (Bishop and Verleger 2013) in order to find the optimal mix of technology usage and personal student-teacher interaction to achieve the maximum efficiency of the blended instruction (Margulieux et al., 2014). Probably, the main line of future research will be the development of measurement instruments specially designed for “Flipped Classroom” settings, based in established blended learning models that provide researchers and practitioners with valid and reliable instruments to analyse these innovative designs and their potential for learning improvement. I am working to improve my class and I am trying to figure out what worked well and what didn’t with watching lecture videos at home instead of lecturing during class. This teaching technique is named “The Flipped Classroom” method. I also want to measure the effects this approach could have on learning. So, I need your help with this questionnaire that would not have any influence in your final grade even it is not anonymous. This is the only way to explore any type of relationship between the teaching strategy I used and final results, the aim of my research project. How many of the lecture videos did you watch? Please, rate each of the activities done during class time to indicate how much you think they have contributed to your mastery of the contents. What are the advantages of the Flipped Classroom? What are the disadvantages of the Flipped Classroom? Would the Flipped Classroom be useful for other subjects? Why or why not? What improvements would you recommend to improve learning in the Flipped Classroom? Please, state any other comments you wish to make about the Flipped Classroom. Bates, S and Galloway, R (2012). The inverted classroom in a large enrolment introductory physics course: a case study. Proceedings of the Higher Education Research Conference – STEM. London, UKThe Higher Education AcademyHigher Education Academy. Bowen, J A (2012). Teaching Naked: How Moving Technology Out of Your College Classroom Will Improve Student Learning. San Francisco, Ca: Jossey-Bass. Costa, F and Coleman, J A (2010). ‘Integrating Content and Language in Higher Education in Italy: Ongoing Research’. International CLIL Research Journal 1(3): 19–29. Coyle, D, Hood, P and Marsh, D (2010). CLIL: Content and Language Integrated Learning. Cambridge: Cambridge University Press. Dee Fink, L (2013). Creating Significant Learning Experiences: An Integrated Approach to Designing College Courses. 2nd Ed. San Francisco, Ca: Jossey-Bass. Revised and Updated. Deslauriers, L, Schelew, E and Wieman, C (2011). Improved learning in a large-enrollment physics class. Science 332(6031): 862–864, DOI: https://doi.org/10.1126/science.1201783 PMid: 21566198. Johnson, G B (2013). Student perceptions of the Flipped Classroom. Master of Arts Thesis for the College of Graduate Studies: Educational Technology. January 2013University of British Columbia. Margulieux, L E, Bujak, K R, McCracken, W M and Majerich, D M (2014). Hybrid, Blended, Flipped, and Inverted: Defining Terms in a Two Dimensional Taxonomy, Paper accepted to the 12th Annual Hawaii International Conference on Education. Honolulu, HIJanuary 2014: 5–9. Marsh, D (2002). CLIL/EMILE, The European Dimension: Actions, Trends and Foresight Potential. Jyväskylä: University of Jyväskylä. Available at: http://ec.europa.eu/education/languages/pdf/doc491_en.pdf. Marsh, D (2006). Stewart, S, Olearski, J and Thompson, D eds. English as a medium of instruction in the new global linguistic order: Global characteristics, Local Consequences. Proceedings of the Second Annual Conference for Middle East Teachers of Science, Mathematics and Computing. Abu DhabiMETSMaC: 29–38.